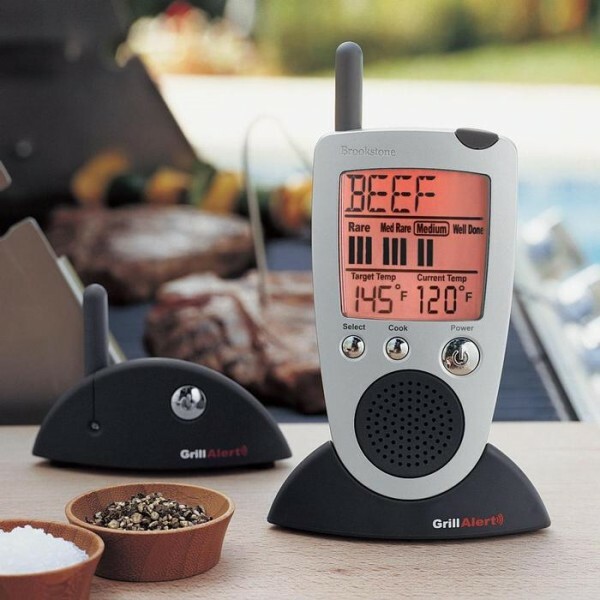 Gadgets For Grilling: Brookstone Talking Remote Meat Thermometer and More! The Brookstone Talking Remote Meat Thermometer takes the guesswork out of summer grilling. It’s one of the biggest challenges all us would-be Bobby Flays face. How do you know when the meat is done? Especially if you’re cooking a larger cut, it can be difficult to know when you’ve crossed the line from raw to perfect to glorified piece of leather. Most people have some kind of thermometer that they can use to check the temperature of their meat, but this usually involves keeping a close watch over your food and periodically stabbing it to see how much the temperature has increased. If you walk away, start talking to your friends, and lose track of time for a few, then you may come back to find your food terribly overcooked. This Grill Alert Talking Remote Meat Thermometer ($69.99) is designed to let you walk away, and it tells you when you need to return to check your food. It comes with a temperature probe that connects to a wireless transmitter and a monitor that you can clip to your belt or set on a nearby table. All you do is select the meat (beef, lamb, veal, hamburger, pork, chicken, turkey or fish) and the doneness level and that’s it. The display will show you both the target temperature and current temperature of your food as well as give audible notifications when your food is close to done and when it’s ready. It’s got a range of 300′ so you really can mingle with guests and not be tied to your grill while you wait for food to cook. I found that it was easy to use and accurate and wandered a bit further than 300′ away before I noticed problems with connectivity. The probe connects securely to the transmitter so you don’t have to worry about it coming lose and has a nice long wire so there’s no trouble making it reach your food. The doneness temperatures are all preset according to USDA guidelines so you know your food will be safe to eat and completely cooked. If you want to mess around with the temperatures, though, you can’t, which may be a drawback for more particular cooks. Still, I really liked this gadget and recommend it highly. I also had a chance to play with the Motorized Grill Brush with Steam Cleaning Power ($29.99). This battery powered brush looks like it would scrape the paint right off your car, and it did have some really good, tough bristles. Fill it with water, turn it on and you’re ready to go. The steam cleaning was great and the brush head gets a good spin going, but if you put too much pressure on the brush, then you’ll make it stop spinning. Ease up just a little and let the brush do the work for you and your grill will be clean in no time. The last gadget I got to try out was a Propane Gauge ($24.99) that’s designed to give you a better idea of just how close you are to running out of fuel. It took about two seconds to install and has a nice graphic that gives you a better idea of your fuel level by accounting for changes in temperature from very hot to much cooler days. The Grill Alert Talking Remote Meat Thermometer, Motorized Grill Brush with Steam Cleaning Power and Propane Gauge are all great gadgets for your favorite grilling expert with the thermometer being a must-have item for perfectly grilled food every time! I received these items for review purposes.